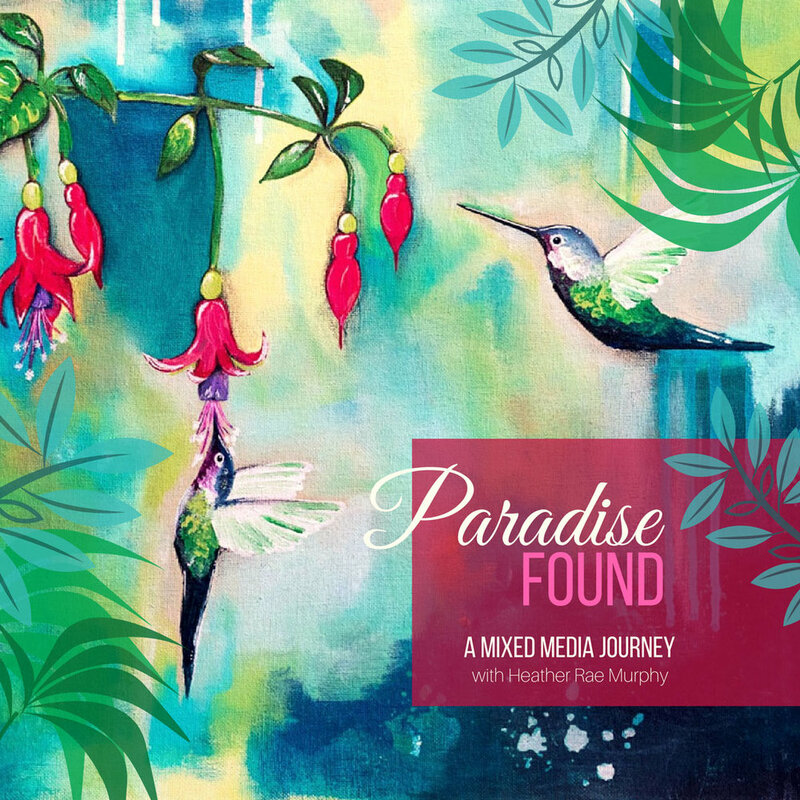 I am so very excited to share my Paradise Found workshop with you! I’m Heather Rae Murphy, a mixed-media artist with a love of turquoise and whimsy. Imagine for a moment the honeyed scent of hibiscus wafting through the air as you stroll down the path of a tropical island. The smell of petals and sunshine. Turtles scurrying to the sea. Birds singing sweetly. Wouldn’t it be lovely to experience that each day? One way I’ve found to invite little bits of paradise into my own surroundings is to bring it into my art practice! 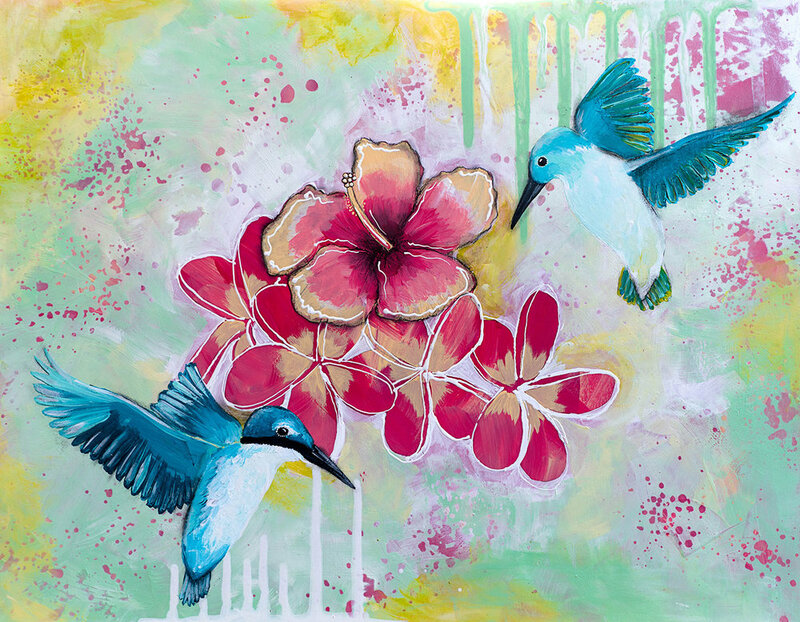 The varied colors of the ocean, the bright feathers of birds, the shapes of tropical flowers. These truly are a few of my favorite things...to paint! I invite you to join me on a journey as, together, we explore the paradise that is Polynesia. We’ll sketch and paint and laugh and play. We’ll try new techniques, make bold moves, and most of all, we’ll have fun! This class takes you on a journey through Polynesia. We’ll explore traditional Polynesian symbols, beautiful Hawaiian words and phrases, tropical flowers, and some of our sweet feathered friends of the islands (the birds!). We’ll talk about the use of symbolism and telling stories with our art. We’ll look at our use of color, create interesting layered details, and learn simple ways to make a big impact on the canvas. I also include a sweet meditation with this class as an invitation to sit down, breathe, and calm your mind before each painting session. Our first project is all about storytelling. We explore traditional Polynesian symbols and incorporate those into our art. You’ll get two PDFs with this project, pairing common Polynesian symbols and Hawaiian words with their meanings. We’ll build a layered background full of collage and paint, learn ways to add lettering to our paintings, paint sweet plumeria flowers, and add unique pieces that pull the story together. As you create, I encourage you to choose symbols and words that speak to you, designing a painting that holds a lot of personal meaning. Our next project focuses on a common symbol of Polynesian culture, the flower lei. We’ll look at the meaning behind the giving of a flower lei and learn to paint bright, expressive flowers in the process. 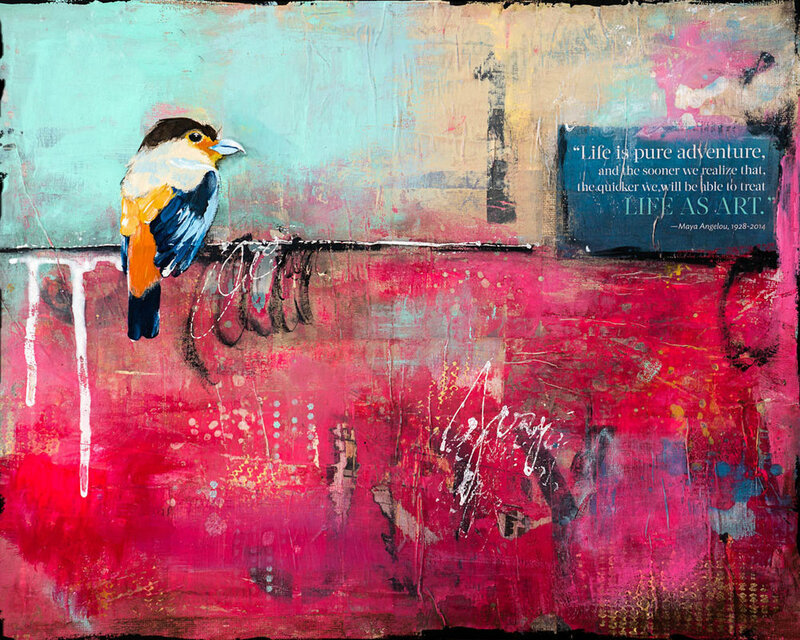 This project gives you the opportunity build a textured, layered background using only paint. You’ll gain new mark-making skills and learn some of my favorite techniques! We’ll also incorporate a bird in this painting, and I’ll show you how I approach painting a perched bird. Our final project focuses on two beloved tropical images: birds and flowers. 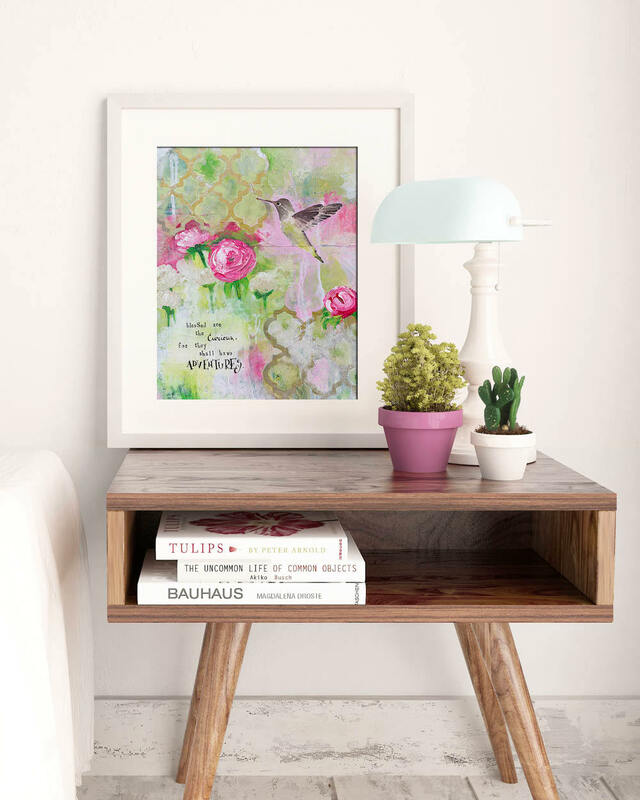 We’ll choose a few of our favorite flowers and create a beautiful centerpiece for this painting. You’ll learn my favorite approach to negative space painting, and we’ll really make your flowers pop. Next, we’ll paint sweet tropical birds in flight. You’ll learn simple ways to paint feathers and add texture. This project will show you how to use several different reference images to create one cohesive painting you’ll be proud to call your own. Paradise has never been about places. It exists in moments. In connection. In flashes across time. This class is for anyone interested in adding a little piece of paradise to their painting practice! 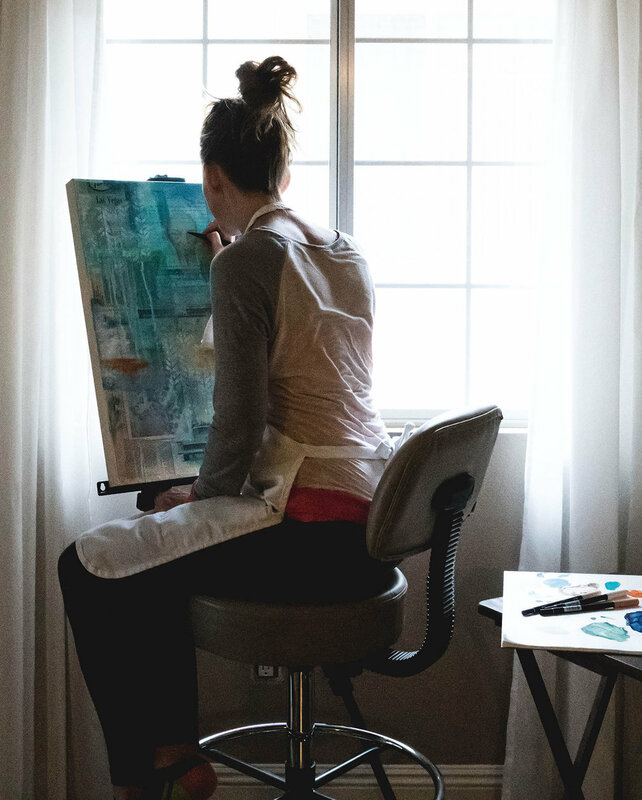 This class might speak to you if you’re a beginner to intermediate painter interested in incorporating cultural symbols and storytelling into your paintings, if you’re interested in learning to create paintings that are rich in texture and color, and if you enjoy adding elements of nature such as birds, flowers, and the sea to your art. If you would like to gain confidence and feel supported as we move step-by-step through each project, I encourage you to join. Please note, items marked with an * are essential for this class.